Honor Sachs. 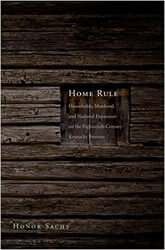 Home Rule: Households, Manhood, and National Expansion on the Eighteenth-Century Kentucky Frontier. Yale University Press, 2015. On America’s western frontier, myths of prosperity concealed the brutal conditions endured by women, slaves, orphans, and the poor. As poverty and unrest took root in eighteenth-century Kentucky, western lawmakers championed ideas about whiteness, manhood, and patriarchal authority to help stabilize a politically fractious frontier. Honor Sachs combines rigorous scholarship with an engaging narrative to examine how conditions in Kentucky facilitated the expansion of rights for white men in ways that would become a model for citizenship in the country as a whole. Endorsed by many prominent western historians, this groundbreaking work is a major contribution to frontier scholarship.